Trade. How does the world define that term? Wikipedia's page says, "trade involves the transfer of goods or services from one person or entity to another, often in exchange for money. A system or network that allows trade is called a market." Art. How would you define this term? Again, the world according to Wikipedia says, "Art is a diverse range of human activities... expressing the author's imaginative, conceptual ideas, or technical skill, intended to be appreciated for their beauty, emotional power, [discipline or effectiveness]." We might then describe "The Art of the Trade" as a technical skill that results in the exchange (buy or sell) of a security in such a way that a client can appreciate its "beauty" or "power" (i.e., contributing effectively to an overall portfolio). A variety of highly personalized, Separately Management Account ("SMA") strategies for higher-net-worth investors that blend Core holdings with Sectors & Themes and Culturally Significant Equities (the "3-Pronged" models). 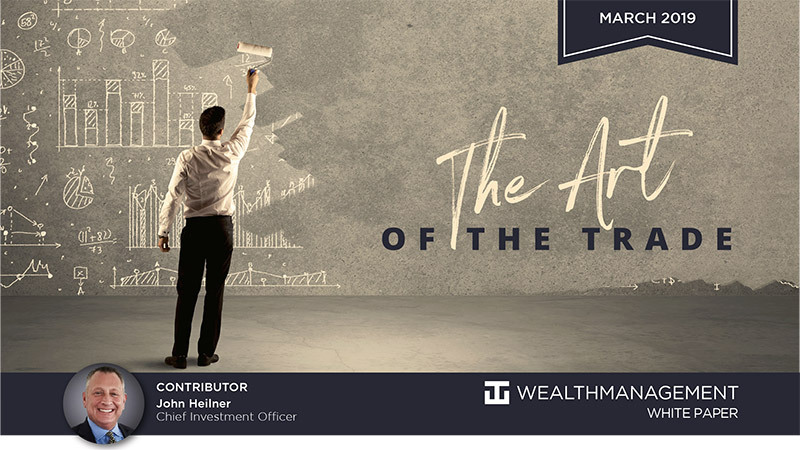 Over the course of the next year, we plan to produce a series of white papers focused on educating you about our investment models and the philosophies and trading strategies behind them - the Art of the Trade series. The information contained in this first paper focuses on the trading techniques employed to harvest and realize gains that are used in the 3-Pronged models. To begin on a personal note, one of the many things I love about my job is reviewing portfolios of new clients when they join the firm. Sometimes I'm examining a self-directed account where the client had been making their own buy and sell decisions, but decided to turn that responsibility over to an advisor. Other times, a new client is leaving their previous advisor and I'm examining the buy and sell decisions of another advisor. In either case it's always interesting to see how an account is allocated, the specific positions owned and the results of those trade decisions. In self-directed accounts I frequently ask the client questions about his/her overall strategy; why they own certain positions; if they are "married" to any of them. The answers can range from "I don't really know" to "I heard about it from a friend or family member" or "I saw it discussed on CNBC". None of those are really wrong. What I find could be improved in many clients' overall strategy (whether self-directed or professionally advised) is the plan for how to make a profit on a position and what the expectations were when the trade was initially made. Was it to own it forever? Was it to double their money? Was it to make 20% and walk away? This is the art of the trade. It sets expectations about the anticipated results of the trade. It keeps you disciplined - fear and greed are powerful emotions. Investing is intellectually and emotionally hard. It's very difficult to sell all or part of a position that has doubled from $25 to $50. The natural thought process is to say, "I'm pretty smart! $100 can't be far off." On the other hand, it's equally hard to buy more of a stock that you bought at $25 and is now at $15. The natural thought process then is to say, "I'm a fool! How could I have made such a mistake?" Yet these counterintuitive, and difficult, choices are often the very ones that should be made. Many aspects of disciplined investing, or disciplined trading, can be very similar to disciplined gambling. The inexperienced gambler might walk up to a blackjack table thinking, "if I don't lose too badly this might be fun." Or, "if I can make enough for dinner I'll be super happy." Most sit down without any plan or exit strategy at all. The casino loves these gamblers. In blackjack, you might start with $300 and an hour later have $500. You're feeling great, sipping a cocktail and making friends with everyone at the table. Forty-five minutes later, you leave the table with just $100, the euphoria is gone and you mumble under your breath, "why didn't I quit when I was up $200 or at least quit when I was only down $50?" "Why didn't I set aside $100 of my winnings for dinner?" The reason? No plan. . . In fact, never even contemplated a plan -- after all, this was supposed to be just "fun". Trading or investing in equities can be very similar. Selling a winner is the only way to "realize" a gain. If you are fortunate enough to buy a stock at $25 and have it go to $100, that $75 per share gain is unrealized. It's much like the equity in your home. It really isn't yours . . . it's just a paper gain . . . until you make a decision to sell and realize that increase. While a "trade" can be very hard to do in your home, it's incredibly easy in a stock. So a savvy investor will consider harvesting gains as the stock appreciates. The proceeds from these realized gains then are available as dry powder to pursue other opportunities, or simply as cash or income. In SMAs, we generally allocate no more than 2%-4% to any individual equity. The allocation size is based on account size, investment objectives and tolerance for risk. Say we buy 100 shares of XYZ at $25 - that's $2,500, or 2.5%, of a $100,000 portfolio. When XYZ gets to $30 per share we sell 15 shares and bring the position back to its original allocation. Now let's say XYZ goes to $35. We sell another 15 shares to bring the position and the weighting back down to the original allocation again. Now, I know, clients will say, why sell 15 shares? What does that do? Well it locks in a realized gain of 20% (or $450) on the first 15 shares sold and 40% (or another $525) on the second 15 shares sold. We like 20% or 40% realized gains. We've also controlled the risk that the paper gains might disappear if the stock value declines. This practice is what we mean by the term "fade trading". Maybe the stock loses some steam and gets back down to $27 or $25 or even $23. Stocks do go up and down as you know. But we still have realized profit in the position, because of the fade trading. How does fade trading relate to blackjack? The same "fading or realizing of gains" strategy should be employed when in the casino. Let's again say you start with $300 and when/if you get to $400 this time you stick $50 in your pocket and let the other $50 ride on your stack. Maybe you get lucky enough to get up another $100. Same thing. . . $50 goes in your pocket and the other $50 remains on your stack. Here is the key. When your money in play gets to $250 (i.e., $50 less than where you started at $300), you are done. The money in your pocket is never part of the decision making process. You get up, thank the dealer and walk away with $100 in your pocket and $250 from the table for a total of $350. Since you started with $300, you've made a 17% return. Now let's look at how to handle losing situations - both when buying a stock or playing blackjack - because those situations do happen. No one ever likes to buy a stock at $25 and then see it at $20 a month later. While we like 20% gains, as above, 20% losses are no fun. At this point there are two things you can do: 1) Sell out or 2) buy more. Most of the time the professional investor, who still sees fundamental value in the stock, is going to buy more - after all, a product you like is now "on sale". A professional investor will have done countless hours of research into an individual stock position. Buying more of that position at $20 per share now should be looked on as a great deal (when $25 was considered a great entry point just 30 days prior). As above, with fade trading on the appreciating side, we now are going to maintain our initial 2%-4% weighting as the value of the stock declines. Using the example trade from above to illustrate, say we buy the same 100 shares of XYZ at $25 - that's $2,500, or 2.5%, of a $100,000 portfolio. But in this case, XYZ falls to $20 per share. So we purchase 25 shares and bring the position back to its original allocation. This time we know clients will say, why purchase 25 more shares in a loser? What does that do? Well, it drives our average cost basis on this position down from the original $25 per share to $24. And if our on-going internal examinations solidify our belief that XYZ remains a buy, we have positioned the portfolio for greater gains if a turnaround occurs. Through thick and thin, we continue with this disciplined approach until our research, or our pre-established thresholds, tell us that we no longer like the stock. Of course, sometimes research does actually tell us that we no longer like the stock. And sometimes a stock does decline below the pre-established threshold. When either of those things occurs, it's time to make the hard decision to exit a position and move on. In blackjack, you shouldn't sit down at the table unless you know exactly how much you are willing to lose. Say you start with $300 and are OK with a $100 loss. That's 20 $5 hands. (I've never seen anyone lose 20 straight hands, but I bet it has happened). So if, after a period of time, you find yourself down the $100, you cash out and walk away with your $100 loss. This does a few things. First, it hasn't thoroughly discouraged you from ever gambling again. And second, it hasn't eviscerated your will to play blackjack in the future. You can revisit the table to continue the fight later that day, the next day, or on a future visit. Without an understanding that losses are part of investing and without understanding one's personal tolerance to experience a loss, many clients reach a point where they simply want out after a market sell-off. "That's it, I'm out and I'll never do that again!" I recently sat with one prospective client who liquidated his account in 2010 and just could never bring himself to decide when was the next time to re-enter the market. He was magical in talking himself out of pressing buy. That was 9 years ago and the client has sat on the sidelines while the S&P 500 tripled in value! Hopefully, in an entertaining and thought provoking manner, I have conveyed that a professional money manager does considerably more than just buy and hold your positions. Professional discipline means that we do have stated goals, objectives and a gain harvesting strategy for every position in our clients' accounts. The times a client has asked why I sold a handful of shares of an appreciating position; or why I purchased a handful of shares in a declining position; are too numerous to mention. . . but now you know. It's fading the position and harvesting the gain on a winner or reducing the cost basis and shopping the sales on a loser. Short of doing that, you are just along for the ride and that's not at all why we invest. We are all in it to realize gains. Please contact your advisor if you would like to learn more. We are passionate about what we do and are always willing to patiently educate the clients we serve.